Ultiworld’s reporting on the European Ultimate Club Finals is presented by Universe Point cleats. All opinions are those of the authors. Please support the brands that make Ultiworld possible and shop at Universe Point! This year, the women’s division at the European Ultimate Championship Finals (EUCF) gave us a first-time champion in Atletico from Espoo, Finland. Atletico were able to take down favorites Iceni from London in the closest final of all three divisions. Further down, Noisy-le-sec’s YAKA were able to finally beat CUSB Shout to take bronze after losing to them in both their prior matchups this season. Atletico is a team that very few felt had a shot at winning this year. In fact, out of the 67 submissions for EuroZone‘s pick contest, only one person even picked Atletico to make the final. This showed the short memory of European ultimate fans, as Atletico were in the EUCF final just two years ago — losing to Iceni 15-11. After the strong showing in 2015, Atletico chose not to participate in last year’s European series. Star player Essi Inkinen said they took the year off because after WUCC in Lecco, EUC in Copenhagen, and WUGC in London, the team simply needed a year off both physically and financially — flights from Finland are among the more expensive in Europe. However, a year off seemed to do them well, as they stormed through this EUCF to take gold. Things looked a bit shaky early on as Atletico were only able to beat the eventual fifth place Mantis from Vienna, Austria, 11-9. Inkinen mentioned that Atletico had three first year players on the team. “We had a game plan and were able to stick to it. We wanted to play our beginners early on and rest our stars a bit for the later stages of the game,” she said. This may partially explain the scoreline against Mantis, but things seemed like they may have gotten out of hand as they started their pool play game against Munich’s Woodchicas going down 5-0. However, powered by their EuroStars force in Inkinen, they were able to storm back and win that game. After a hotly contested matchup with Bologna’s CUSB Shout, they won 12-10 and finished the pool undefeated. As they entered bracket play they started to tighten up lines and dispatched the French YAKA 15-12 in the semifinal, giving themselves a shot at Iceni in bracket play. In the final, London were able to break first, but Atletico quickly went on a three point run with Iceni unable to stop Katrina Rantanen deep for the entire first half. Anni Jokinen was also impressive, especially on defense, able to priduce a key layout block on Iceni’s Jacqueline Verralls. In the second half, the Finnish leaders Maija Leino and Inkinen were solid rocks for the Atletico offense; though Iceni managed a few breaks here and there, Atletico held on to their lead and ended up winning their first European title 15-12. Unlike Atletico, Iceni are a completely experienced, dangerous roster from top to bottom. They completely blew through the compeition in Caorle during the first two days of competition — their closest game was against YAKA in pool play, where they won 15-9. They benefitted from the rapid cutting and movement of Jaqueline Verralls, Francesca Scarampi, and Vanessa Lowe to completely dismantle Italy’s CUSB Shout 15-6 in the semifinal. Jenna Thomson also made huge plays all weekend, both shooting the disc from the handler position and getting gigantic blocks, including against Atletico in the final. Having completely overpowered teams all weekend, Iceni have to be disappointed by a second place finish. This is the second year in a row where they didn’t get gold; they lost to CUSB Shout on double game point in the EUCF semifinal last year. London’s main weakness this past weekend was overthrows, which allowed Atletico to keep control of the final. Their deep game was simply not on point as shots to Verralls couldn’t seem to connect. They also had issues with offensive consistency in earlier games. The difference in the first two days was that their defense didn’t allow teams to score after they made mistakes, whereas Atletico had the firepower to punish them. Though Iceni are likely upset with a second place finish, they should also be happy that a team is able to expose their weak points as they prepare to challenge the top teams from the rest of the world at the WUCC next year in Cincinnati. YAKA and CUSB Shout were the top two teams from the southern region this year. The French and Italian powerhouses faced each other twice in 2017, with Shout winning 12-7 at Windmill and 15-12 at EUCR-South. Shout had a great tournament but were very frustrated after their loss to Atletico in the last game of pool play. Coach Barbara Bondi mentioned that they took that frustration into their semifinal against Iceni which had a lot to do with why they were unable to put up a stronger showing there. However, they did try to shake things off to go up against YAKA. To their credit, they fought really hard in that third place game, with German pickup Anna Gerner looking especially impressive. EuroStars player Laura Foralfi and the large target of Greta Melega also played fantastic games. But they were just not ready for what YAKA had in store. When one talks about YAKA, a few key names usually come to mind. Aline Mondiot and Daniela Rodriguez are almost always the star players, with Mondiot’s elite handler movement and throwing ability and Rodriguez putting up high release lefty breaks and being an unstoppable target in the endzone. Though these two players were big in the third place game, the MVP of the match is undoubtedly Alexia Chassigneux. The 22 year old made plays in every way possible for YAKA, from huge defensive blocks, floaty half-field leading passes for scores, and skies taking on the toughest matchups that CUSB Shout could throw at her. 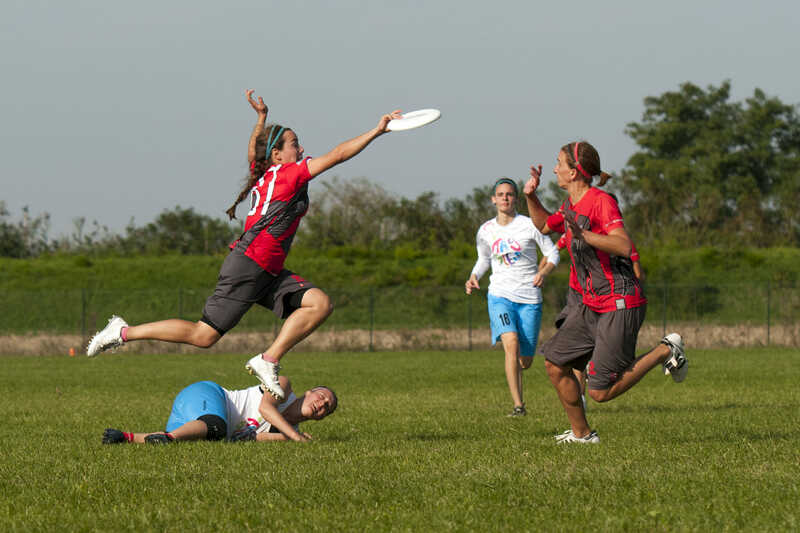 Chassigneux is not a stranger to high-level European ultimate, but look out for her to be an even bigger name after the performance she had in Caorle. Things looked tight in the first half with YAKA able to just barely take the lead 8-7. The first point out of half was a marathon with three timeouts being taken and YAKA finally scoring after around 20 minutes. This seemed to be the turning point for the French women, as they took stock of their two point lead and let their bench run a lot of points throughout the second half to give their stars a bit of a break. They got a few more breaks and finally brought their stars back into play when they were up 12-9, capped to 13. They punched in the score and brought the bronze back to France. While there were some very compelling games outside of the top four, these four teams were clearly a head above the rest of the field. The fifth place Mantis from Vienna, Austria did manage to keep it close against Atletico in the first game of the tournament, but lost 11-9. However, they were blown out but fourth place finisher CUSB Shout, 15-8. Last year’s European champions, FABulous, were not able to recover from the loss of star players Olivia Hauser and Yannicka Kappelmann; they finished 10th. The rest of the teams will need to retool if they want to challenge the dominant top teams in Europe — and the world — in future seasons. Comments on "EUCF 2017: Tournament Recap (Women’s Division)"